4 So, what do you do with all this information? Despite the benefits of good tracking habits, they are often the neglected part of a bodybuilding program. Even people willing to put all the hard work in at the gym often won’t take just a few minutes each month to find out exactly how their bodybuilding training is affecting their physiques. Gaining mass isn’t always a smooth ride. When the plateaus come it is those people who have a tracking program to refer to who move on to bigger better things. Most people don’t track. And most people don’t gain significant muscle mass. Trust me when I tell you that there is a correlation. To get maximum production and minimal frustration from your bodybuilding training program – Maintain a Good Tracking Program. There are many nutrition and fitness journals on the market that you may want to check out. Most of them are a lot of fluff and seem geared towards the aerobics-type fitness program. Personally, I use a simple little notebook and then transfer my data to a software tracking program on my computer. Several of the top programs on the muscle building programs reviews page offer some very good tracking software as part of their packages. They will record workouts, diets, body-fat percentages and body measurements. There are also various software only programs you can purchase (though they typically cost as much as the programs and aren’t any better). And there are a lot of online fitness logs that will help you track (like fitday.com). 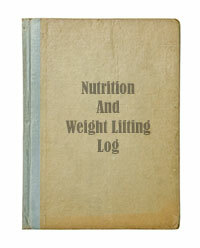 Using fitness and nutrition tracking software or an online fitness log will not eliminate the need for a notebook that you can keep handy at all times. Don’t try and remember how many bench dips you did in your second set when you finally get in front of your computer 12 hours later. Your focus at the gym should be 100% on your bodybuilding training and a notebook that quickly records your stats will help you keep that focus. Body composition measurements will measure the effectiveness of your bodybuilding training. These measurements work together, they complement one another. It is not enough to go by your weight alone. This doesn’t tell you what you are gaining (fat or muscle) or where you are gaining it. These measurements are extremely important. What they tell you will guide your decisions on when to make adjustments to your diet, supplements, weight training routine and other factors to keep the gains coming fast. Do not skip these measurements; they are vital to the success of your bodybuilding program. Weight – Check and record your weight about once a week. To measure your weight you just need an ordinary bathroom scale. The concern here is to get a consistent measurement so you don’t need to be overly worried about the overall accuracy of your scale (if it says you’re 170 lbs. when the carefully calibrated scale at the doctor’s office always pegs you at 173 lbs., no big deal, as long as it can measure your weight gains). Towards the goal of consistency, make sure that certain conditions remain constant each time you jump on the scales. 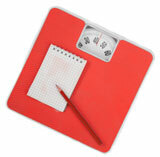 Always weigh yourself in the same place (floor give in different areas of your home can give you different readings). Always weigh yourself first thing in the morning, after you have urinated and before you have eaten anything or showered. Body Fat Percentage – Measure and record your body fat percentage about every two weeks. Do Not, I repeat, DO NOT do a bodybuilding training program without keeping track of your body fat percentage. You are trying to gain muscle, not body fat, and you need to make sure that muscle weight gain is responsible for a significant portion of your weight gains or you need to adjust your bodybuilding training. Body fat percentage can be estimated many ways including taking skinfold measurements with body fat calipers and then doing some calculations. To learn how, go to the Skinfold Measurements Page. 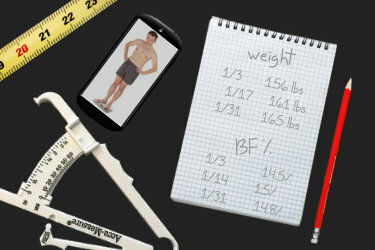 And then plug your measurements into the Guide’s Body Fat Calculator. Lean Body Mass – Figure your lean body mass after you calculate body fat percentage. This is just a simple calculation based on your weight and body fat percentage. It will estimate how much of your weight is in body fat and how much is muscle. Learn more about Lean Body Mass. Body Tape Measurements – Take your body tape measurements about every two weeks. These are the measurements that will let you know just how big your biceps are getting as a result of your bodybuilding program. To take these measurements you will need a body measuring tape which is just a flexible tape that can wrap around your body parts. Check out the Body Tape Measurements page for the where’s and how’s of these measurements. Photos – Strip down to your shorts and take photos about once a month. Don’t forget the pictures. Especially if you are a beginner, I guarantee that four weeks from your start date you’ll wish you had evidence of that puny man you once were. Photos can provide great motivation and encouragement but more than that they can show areas of your body that you need to work on. While the body composition measurements tell you where you are, the nutrition and fitness journal tells you how you got there. Effectively tracking what you are doing in all aspects of your bodybuilding training will mean you never waste your time. Even if your body measurements are not improving, you have accomplished the important task of determining what does not work for you. Effectively training your body will involve some trial and error and keeping an accurate account of what you are doing will assure that you don’t spend unnecessary time on the error part. Nutritional Intake – How detailed you want to get in recording exactly what goes into your body is up to you. The more detailed you get, quite obviously, the more you will have to go on. At the very least you need to get a fairly accurate estimate of the protein, carbs, fat and water that you consume on a bodybuilding program. If you are just beginning, I highly recommend you keep a detailed diet journal for a couple of weeks. You will learn a great deal. As you become more experienced, you may find it easier to use a base diet method. To find out the nutritional content of what you are eating, check the databases linked from the Bodybuilding Diet and Nutrition Resources page. Supplements – Tracking your supplement use is definitely a smart thing to do. Some supplements are expensive and only with an accurate journal will you be able to determine if their benefits are worth their cost. Creatine, for example, for all its accolades, doesn’t produce overwhelming results in everyone. Make sure you note the date you start a specific supplement, dosage information and how you take it (morning, after workout, etc.). Weight Training – You absolutely need to know the specifics of the routine you are doing. You need to know the exercises and the order you performed them, the tempo used, the sets, reps, weight lifted and all other information relevant to your bodybuilding training workouts. Be sure to record the time you spent on your workout from start to finish and include an honest appraisal of the intensity. Miscellaneous – A lot of factors can influence your results. If you had a particularly hectic work week and were unable to get your normal sleep in, this is going to affect your bodybuilding training program results. If your car breaks down and you have no friends and therefore must walk the 5 miles to work and back every day for a week, this will affect your results. 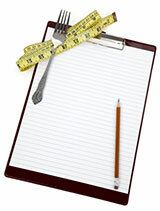 Anything that can affect your results should be noted in your nutrition and fitness journal. While the necessity of tracking what you do may not be apparent when you start, it will become apparent as you progress. For some sample ways that this data will benefit your bodybuilding program down the road, check out – Using Tracking to Keep Muscle Gains Coming.